Can you believe that Christmas is just five months away? 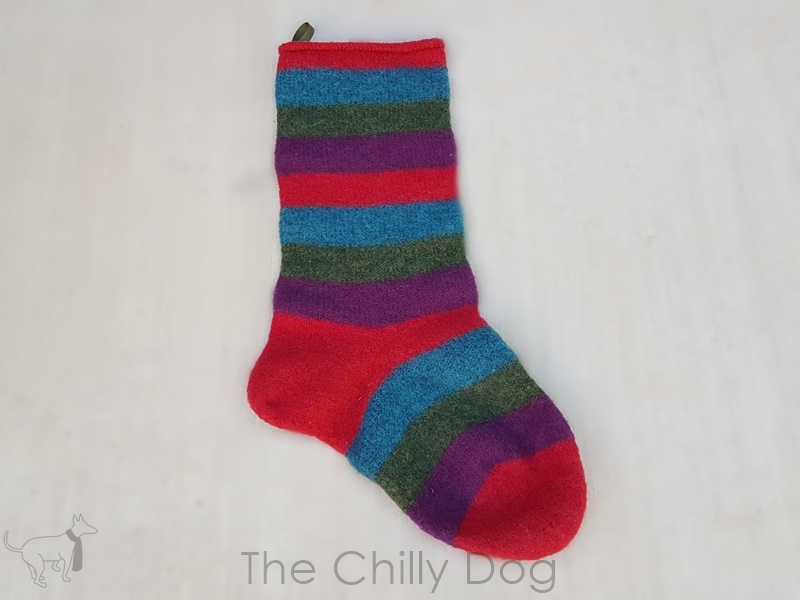 For years I have wanted to make felted knit Christmas stockings for our family, but it's something I have just never got around to until now. To make an extra sturdy, stuffable stocking, I decided to knit my Christmas stockings with 100% wool yarn and then felt them in the washer/dryer. The pattern is very similar to a normal knit stocking, but it is made on a much larger scale. These Christmas stockings are worked from the top down with a German short row heel. Rounds begin at the back of the leg/bottom of the foot. 1 skein of Universal Yarn Deluxe Worsted Wool (3.5 oz/100 g, 220 yd/200m) in each of four colors (shown above in Real Red, Azure, Woodsy and Plum Dandy) - It is very important that you DO NOT USE SUPERWASH YARN or the stocking will not felt. DS - double stitch - With the working yarn forward, slip one stitch (purlwise) from the left to the right needle, bring the working yarn over the top of the right needle and pull firmly. As shown, Color A is Real Red, Color B is Azure, Color C is Woodsy and Color D is Plum Dandy. Begin with Color A, CO 80 sts evenly around 4 dpns. Rnd 1-14 (Color A): K all sts. Rnd 15-28 (Color B): K all sts. Rnd 28-42 (Color C): K all sts. Rnd 43-56 (Color D): K all sts. Repeat Rnd 1-56 once more. Rnd 57-63 (Color A): K all sts. The entire heel is worked in Color A across 40 sts. Row 2 (WS): DS, p39. Row 3: DS, k to next DS. Row 4: DS, p to next DS. Repeat Rows 3-4 twelve more times. Row 5 (RS): DS, k6 (at this point there should be 14 Double Stitches on each side of the heel) k6, [k all strands of the next DS tog] twice. Row 6 (WS): DS, p to next DS, [p all strands of the next DS together] twice. Row 7: DS, k to next DS, [k all strands of the next DS tog] twice. Row 8: DS, p to next DS, [p all strands of the next DS together] twice. Repeat Row 7-8 eleven more times. Row 9: DS, k19. At this point you should have one remaining double stitch on each side of the heel. Rnd 1 (Color A): K19, k all strands of DS tog, k40, k all strands of DS together, k19. Rnd 2-7: K all sts. Rnd 8-21 (Color B): K all sts. Rnd 22-35 (Color C): K all sts. Rnd 36-49 (Color D): K all sts. The entire toe is worked with Color A. Make sure your sts are divided evenly around 4 dpns. Rnd 2: On Needles 1 and 3, k to last 2 sts, skpo; On Needles 2 and 4, kpno, k all sts to the end of the needle. Repeat Rnd 1-2 until 40 sts remain. Work only Rnd 2 until 12 sts remain. Knit 3 sts from Needle 1 onto Needle 4. Slip sts from Needle 2 and 3 onto a single dpn. Break yarn leaving a long tail. With the yarn tail use the Kitchener Stitch to graft the Toe. Before felting, your stocking will be very large. To felt your stocking, machine wash and tumble dry (warm water and medium heat) with a medium sized load of similar colored items. Do not over-dry. Make sure to slightly roll the top edge of the stocking before drying. 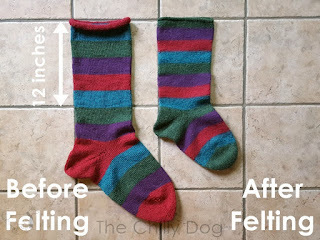 It may be necessary to wash and dry a second time for the stocking to felt to the desired size. If needed, lightly spray the stocking with water and block so that the stocking is 7 ½ inches wide, the leg is 18 ½ inches from the top edge to the bottom of the heel and the foot is 14 inches from the back of the heel to the tip of the toe. After felting and blocking, hand stitch a loop of ribbon onto the stocking so it can be hung. 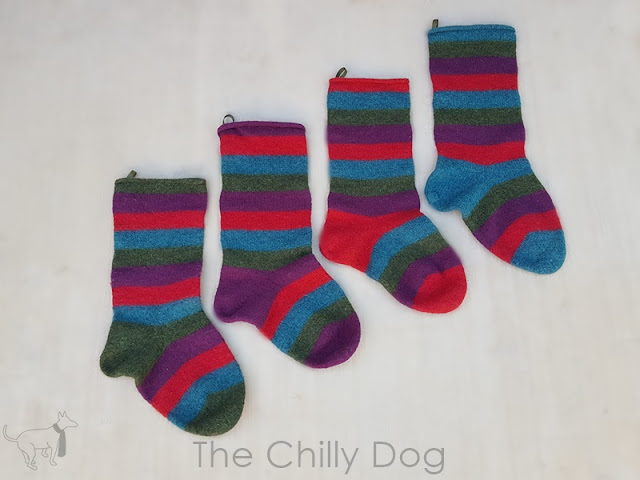 A printable version of my Simply Striped Christmas Stocking is available in my pattern shop and includes additional information about yarn requirements and felting tips for making a set of four coordinating Christmas stockings. Make your Christmas extra special by crafting hand knit, felted Christmas stockings for the family with four colors of wool yarn.